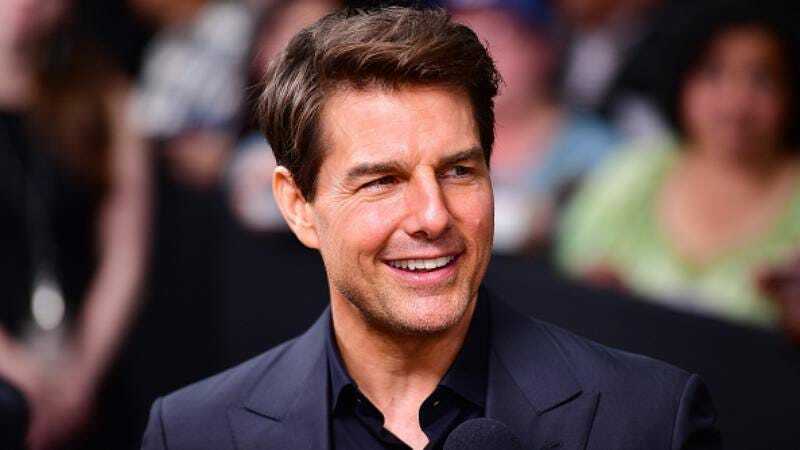 Tom Cruise remains as popular as ever, despite being in one of the more torturous stages of his career—the Mission: Impossible franchise star now regularly signs up for onscreen manhandling by directors, supernatural beings, and Emily Blunt. His penchant for punishment isn’t something we can really delve into in this particular space, but it has given his career a boost. Fans now wait in line for a chance to see Cruise rapell a skyscraper or hang onto a plane for dear life. And the aging action star keeps upping the ante—he apparently trained for a year to do a stunt in Mission: Impossible 6. Unfortunately, it looks like something went awry in the execution of that stunt or another one on the set of Christopher McQuarrie’s film. According to TMZ, Cruise may have injured himself while attempting to jump from one building to another. The celebrity news outlet posted a video of the botched stunt, and it shows Cruise, who’s rigged to a wire, jumping from a platform to the roof of a building. But he misses his mark, and ends up hitting the edge pretty hard. He scrambles his way to the top, where he tries to walk the incident off, but he’s pretty obviously limping. There’s been no statement about a possible injury from Cruise’s camp or the production companies (Bad Robot/Skydance), or even a delay in filming. Again, we’re not even sure this is the stunt he was preparing for over the course of the last year; given the advance buzz, it seems more likely that the latest action set-piece will see him strapped to a rocket headed to a secret moon base or something. But he might be rethinking that now.